This swelling showed up overnight! 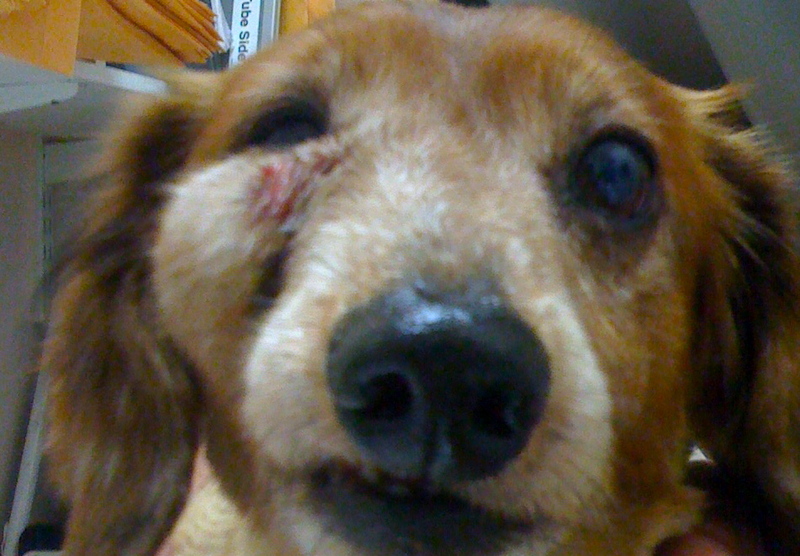 “Doc, I swear he looked fine yesterday!” said the 10-year-old Miniature Dachshund’s dad. The right side of Manny’s face above the upper jaw and next to the bridge of his nose looked swollen like a golf ball. It felt firm but not hard. A little spot of blood and yellow-green liquid eked out of a hole under the fur by the bridge of his nose. “Manny ate breakfast and everything else seems fine,” said Manny’s dad. At this point, Doc Truli knows that pessimistic people ask if it’s cancer and optimistic people ask if it is an insect bite. Almost nobody thinks of the obvious, most likely diagnosis. “Manny has a tooth root abscess,” said Doc Truli. When the upper side of the face swells suddenly like this, it usually involves an abscess that has festered at the tip of the root of the carnassial (aka fourth premolar, aka 108) that finally tries to break out through a path of least resistance. In Manny’s case (and many dogs), the pus swells up between the cheek muscles and breaks out through the skin under the eye. Sometimes it even breaks out through the conjunctiva (the white connective tissue around the eye). When this happens it looks like pus coming out of the eye. The fourth premolar, otherwise known as carnassial tooth, looks terrible when it is infected and loose. A thorough annual physical exam would have predicted this outcome. Probably Manny’s regular veterinarian recommended a “dental” in the past. Probably Manny’s family thought it cost too dearly to find the space in the family budget. The other main reason families put off dental surgery in their Dachshunds in a heart murmur. Fear of the anesthesia hurting the heart makes people delay treatment. Ironically, the longer you delay, the worse the teeth and the heart become. A heart murmur seems an inevitable result of severe dental disease. The tartar holds the plaque biofilm. The plaque attracts and protects very harmful bacteria. This bacteria eats away at the roots of the teeth and the tiny ligaments that hold the teeth in the socket. The bacteria also easily travels through the blood the tiny, filmy heart valves. Lodging on the heart valves, especially the mitral valve, the bacteria make the valves thick and nodular. Then the little valves do not close tightly. Think of a window with little rocks and grit and dirt on the window sill. The window will not close tightly, right? Same with the heart valves. 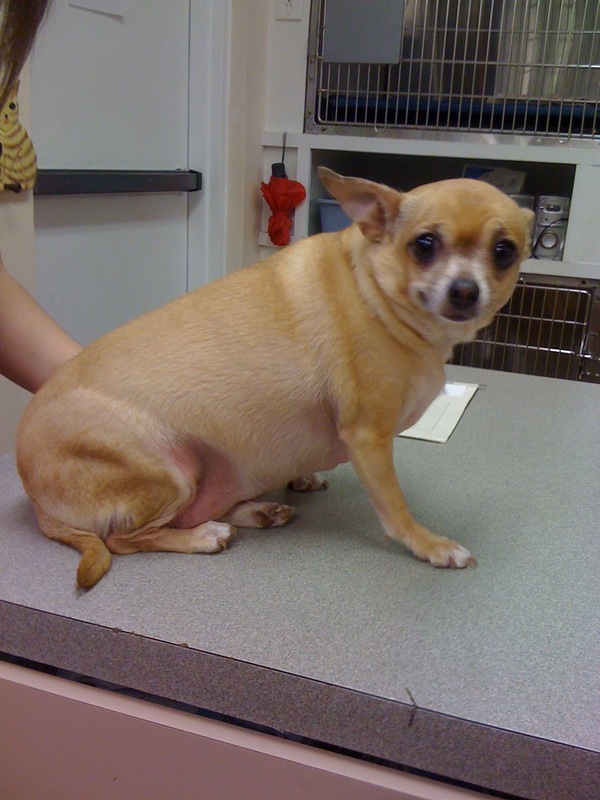 Then your veterinarian hears a heart murmur, an abnormal sound caused by blood not moving smoothly through the heart. Now you are worried about heart disease. Suddenly, anesthesia and tooth cleaning becomes much riskier. Now you must have the heart checked out to increase the confidence in the safety of the anesthesia. Many families cannot afford these tests and stop at this point and “wait and see” with the teeth. Instead, they should talk candidly with their veterinarian about risks and affordability. It may be worthwhile to take care of the teeth without a full cardiac work-up, as long as everyone understands the risks. Poor tooth care and dental disease shortens our lifespan and our pets’ lifespans by years. Years. What’s a better way? Start tooth care early. Start brushing your puppy’s teeth when he or she is very young. Go to the veterinarian’s for a check up at least yearly. 75% of cats and dogs have periodontal disease by the age of three. That means it started at 1-2 years old! 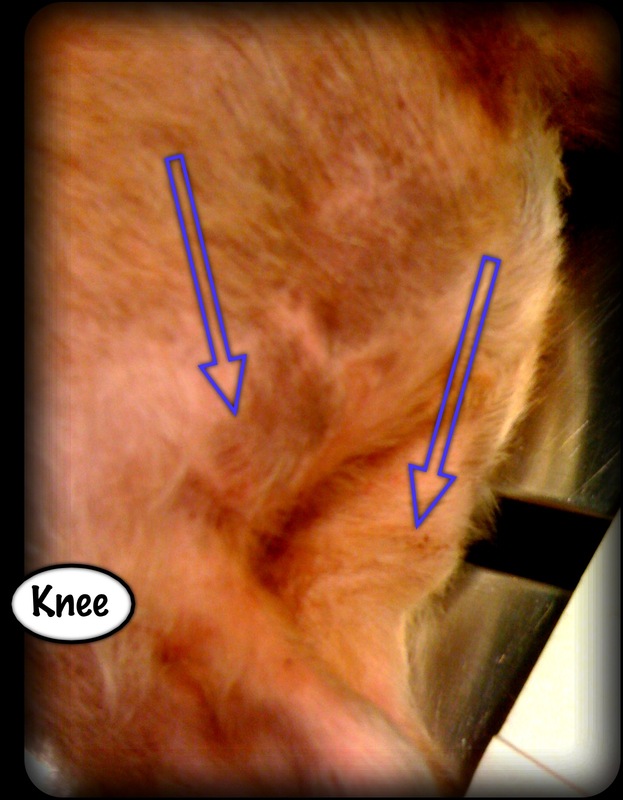 So those check-ups you thought you did not need because your pet was young? Not so fast! Make an appointment! If your older pet or foster or adopted pet already has dental disease, get it taken care of as a high priority as soon as you can. Once a tooth root abscess becomes a swelling on the face, you have an emergency. Manny weathered his emergency tooth root surgery well. His heart murmur was not associated with heart failure, so with careful anesthetic monitoring and luck, he recovered perfectly well. 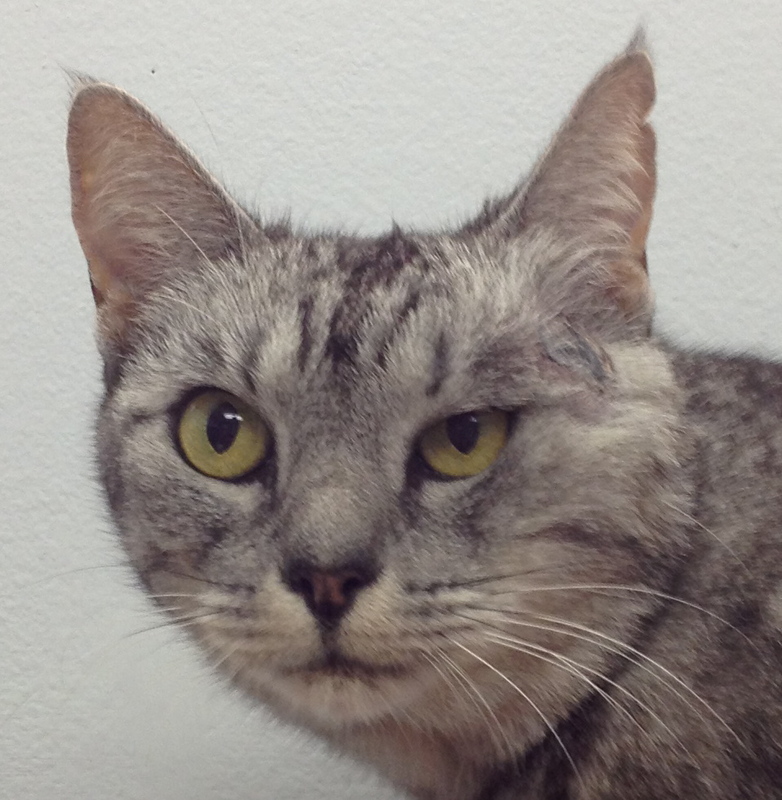 Manny needed 10 more teeth extracted that would have become another abscess in the future. 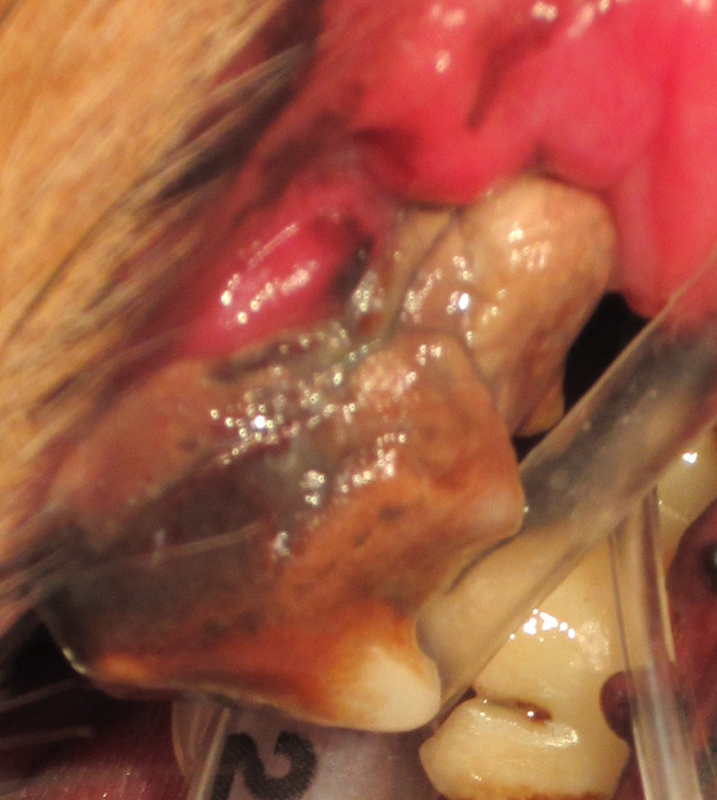 “Labradors and other large chewing type dogs often fracture a carnassial tooth and so the tooth root abscess may be the singular oral pathology they suffer. Dogs like Miniature Dachshunds often suffer progressive long-term periodontal disease and the abscessed tooth is one of many,” says Doc Truli. Help! My Dog’s Breath Smells Bad! and many more under the Dental Success Stories Category in the right Sidebar. It’s fine Doc Truli. I was just looking for information about what was happening with my dog, and I found it here, so thank you. I don’t like to think I was a negligent owner, and this is a complicated doggie, which I won’t get into. That’s got nothing to do with you. I’m sure this kind of thing is more common in pets with less attentive owners, but it can apparently also happen with little warning or signs in dogs with owners who are paying attention and taking good care. James, thank you so much for the personal note. I hope your little one feels all better! This is good information if a little patronizing to pet owners. My 4 year old dachshund seems to have this issue. I say seems to because her teeth look fine. There was nothing to have spotted until her face swelled up, and it did happen in less than a day, giving the impression of a bee sting or trauma injury. 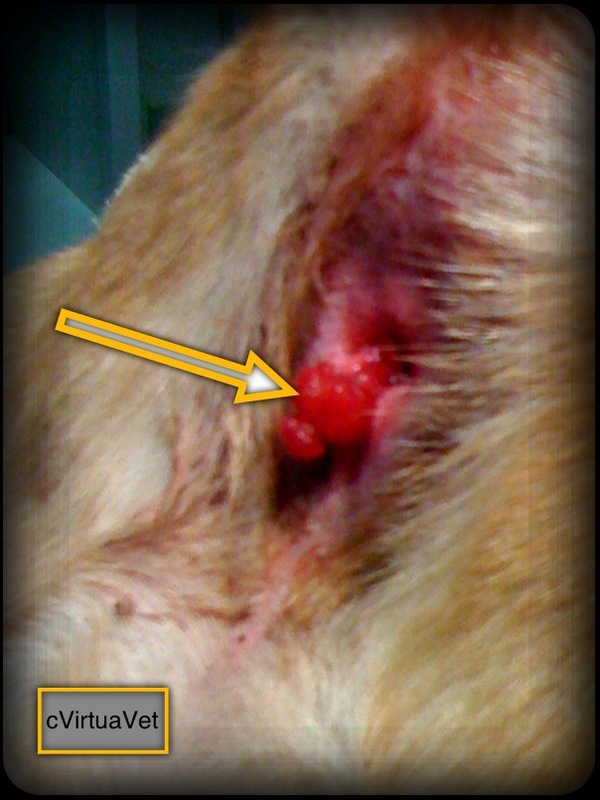 There was no bleeding until later, after the vet used a needle to take a sample, it drained spontaneously the next day. 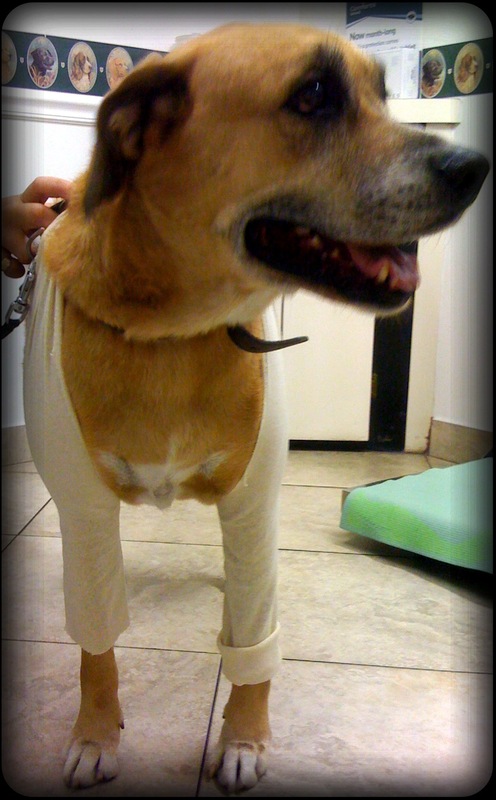 Barkly is on antibiotics and another medication for the inflammation. I expect she’ll probably need to have a tooth pulled, and if so, I’ll see if they can do a cleaning at the same time, but I don’t feel like this would have been caught earlier with more vet care. I appreciate your feedback about whether or not the problem could have been prevented with routine vet care. Maybe, maybe not. I saw a 3-year old Dachshund for a full professional cleaning and then 6 months later, when she had tartar again, at another cleaning, there was a mobile, infected molar. Somehow that unfortunate dental disease occurred between very regular cleanings in a young dog with no history of periodontal disease. So of course, a disease can occur a day after a check-up and not have been present the day before. However, we do now that 75% of dogs over the age of 3 years have significant periodontal disease. We also now that the vast majority of these dogs do not receive anesthesia and professional dental treatment. So, I write these stories for the people that may be considering treatment, or that may have gotten the treatment for their pet and they are looking for validation of their decision to partake of veterinary services. You will not know if Barkly had any underlying disease until she is under anesthesia for a deep cleaning, 6-point examination of each tooth, and dental x-rays. I wish her a full and speedy recovery.